The University Veterinary Teaching Hospital Sydney has a number of Practitioner Evenings in 2017. Below are the planned dates for these evenings. For further information on speakers or to inquire about attending please contact Clare Hughes on (02) 8627 6194 or by email clare.hughes@sydney.edu.au . Article by AAP featured in the Sydney Morning Herald. Is the ball red or green? Your dog may not know. Ruggles is a long time patient of Sydney Uni Vet and was visiting the practice due to a heart condition he had. He had an irregular heartbeat (so-called atrial fibrillation) which caused him to feel unwell (poor appetite, weight loss, poor exercise tolerance). This condition was treatable however the practice did not have the defibrillator required to treat Ruggles. Ruggles ‘Dad’, a longtime client and supporter of the practice kindly offered to make a donation to cover part of the cost of the equipment to treat his dog and others with a similar condition. Dr Beijerink and the practice were able to quickly arrange the delivery of the defibrillator so Ruggles could be treated. 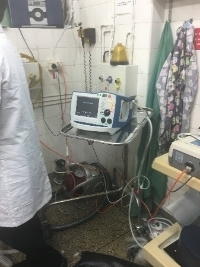 This machine consists of delivering at exactly the right moment a therapeutic dose of electrical current to ’reset’ the heart rhythm. 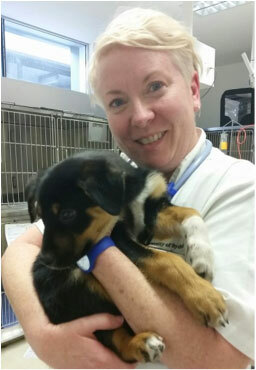 The treatment was a success and Ruggles has recently been back in the practice for a check-up. The great news is that his heart rhythm is successfully converted back to normal for extended time, and Ruggles also has been great (good appetite, good activity level). We couldn’t be happier with this result at this stage and thank Ruggles’ Dad for all his support as many other dogs have also now benefited from the practice having the defibrillator machine. You can help more animals like Ruggles and be part of the University’s INSPIRED campaign by giving to Sydney Uni Vet Hospital. Some of the latest research from the Faculty of Veterinary Science at The University of Sydney has been covered in a number of media outlets, with the Honorary Associate Professor Max Zuber from the University of Sydney’s Veterinary Teaching Hospital being interviewed on this research. 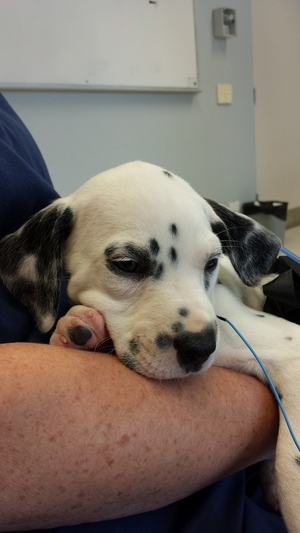 Deafness occurs in dogs probably with the same frequency as in people. The most common causes are congenital (recognised generally in the first 6 months of life) and age related (senile or degenerative deafness). 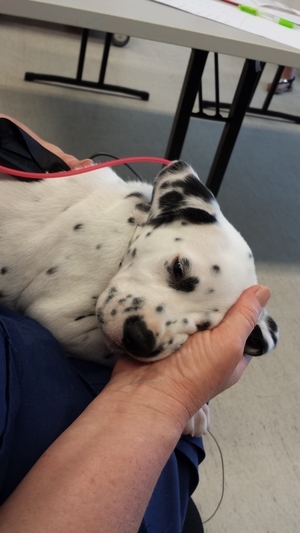 Congenital deafness is most likely due to a genetic abnormality and is seen more commonly in some breeds including Dalmatians, Australian Cattle Dogs (ACD’s) and English Bull Terriers. 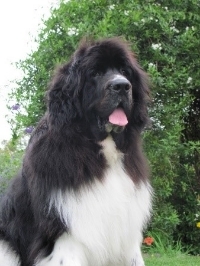 It can, however, be seen occasionally in any dog breed and deafness is usually apparent by 6 weeks of age. Deafness may affect one or both ears. Deafness due to genetic abnormality unfortunately is permanent. Brainstem Auditory Evoked Response (BAER) testing is the most sensitive test in assessing hearing. Other less sensitive tests are available e.g. BAERCOM, but these tests are significantly less accurate. 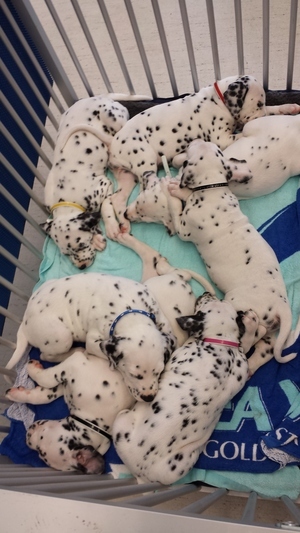 Breeders of Dalmatians, ACDs, English Setters and Bull Terriers are encouraged to routinely have puppies hearing evaluated by BAER testing prior to pups going to pet homes, and before making breeding decisions in an effort to reduce the incidence of deafness in their breeds. 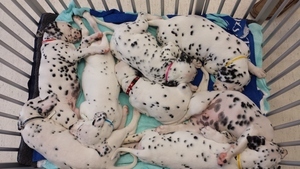 Researchers at the University of Sydney are working with Dalmatian breeders to try and establish the genetic basis for hearing loss in this breed. 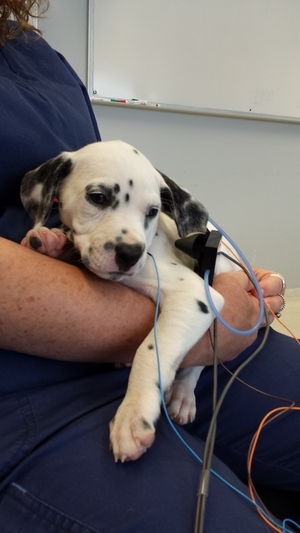 BAER testing can be used to evaluate the hearing of any dog (or cat), young or old that is suspected of being deaf in one or both ears. It is a test that determines whether cochlear function (inner ear) and the “wiring” to hear, is intact. The volume of the sound in the test can be varied but this test does not assess degree of any partial hearing loss. However “selective” deafness can be distinguished from true deafness! BAER testing requires ear plugs to be worn and 3 fine electrodes to be inserted under the skin. 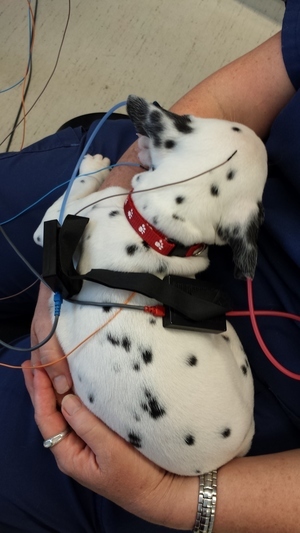 A mild sedative is usually given prior to testing so the foam earplugs don’t irritate puppy’s ears. A lot of cuteness in these photos! 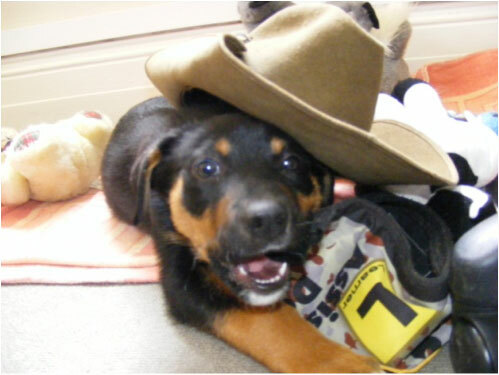 Ranger is a happy and healthy 13 week old Kelpie-cross pup who has faced his share of trauma already at such a young age. He was found lost and alone, wandering through rugged bushland around Abercrombie Caves in NSW’s Central West, at least 20km from any roads. 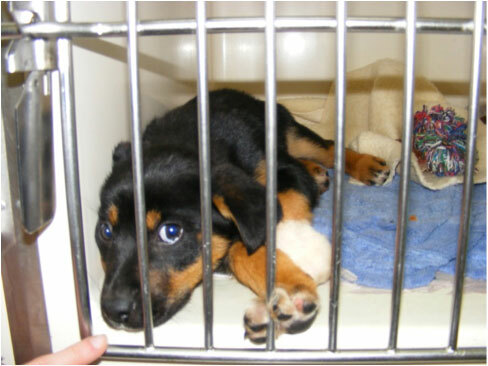 He appeared from out of nowhere – tiny, injured and afraid, he was only nine weeks old. 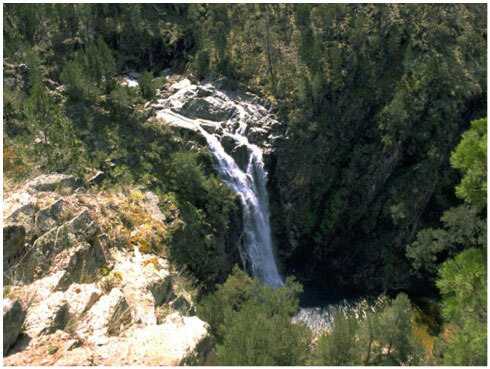 We have named him Ranger because this area has an infamous history as being a hideout for bushrangers such as Ben Hall, Frank Gardiner, and the Ribbon Gang. Our little puppy was roaming around out there just like a bushranger. 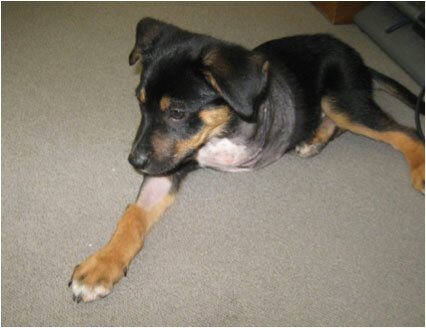 Ranger was emaciated and had a broken front leg which he was struggling to drag along the ground. At first he was afraid but quickly started wagging his tail once in the car and safe. On the lap of a caring person he breathed a huge sigh, like a sigh of relief, then he slept in the car all the way to Bathurst. He was totally exhausted. Ranger was taken straight to a local vet to be examined and it was apparent his injury was several weeks old. 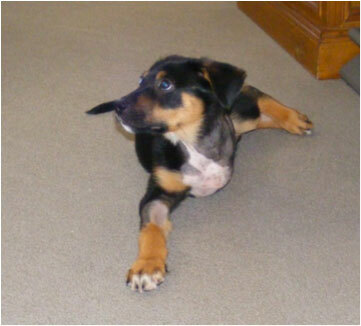 His left foreleg had multiple fractures and he had significant nerve paralysis. Further examination of his ribs and hips indicated that he had not eaten anything for at least 4 or 5 days. Veterinary advice was that Ranger’s leg would need to be amputated and the surgery could cost several thousand dollars. 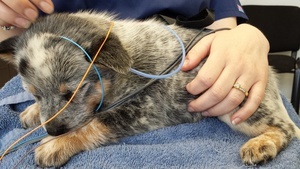 It was clear that a nine week old puppy requiring significant surgery prior to adoption, was most likely ‘unadoptable.’ Consequently, his future appeared grim. After having had such a terrible struggle for survival in his short life, refusing him help was an option too cruel to bare. 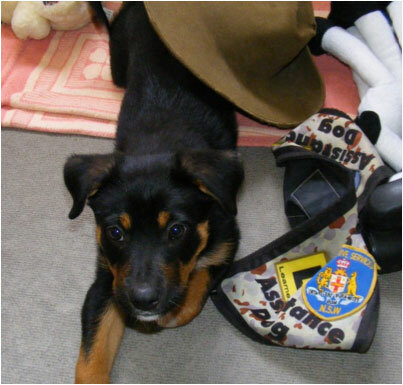 The Dogs for Diggers program managed by Louise Kelly at Bathurst Correctional Centre, immediately undertook to adopt and help little Ranger – perhaps he could be a therapy dog for one of our brave soldiers from Afghanistan or Iraq. He had already proven he was just as tough, overcoming extreme adversity just as they have. Surely any one of our war veterans could relate to Ranger’s struggle to survive when the odds were stacked against him. The University Veterinary Teaching Hospital Sydney agreed to help and they reviewed Ranger’s injuries in an attempt to save his leg. The care and compassion they gave to our little boy was wonderful. He was given the best medical attention possible and remained in hospital for six days. Unfortunately, despite all their efforts, specialist orthopaedic surgeons could not save his leg and it needed amputation. Thanks to all the staff at the Hospital for their kindness towards Ranger. On one occasion a staff member phoned just to tell me that Ranger was a “superstar”, and that they all adored him. The amazing volunteers from German Shepherd Dog (GSD) Rescue also put their hands up to help Ranger. They travelled from Sydney to Bathurst and back with our injured boy, delivering him to the University for his specialist treatment. Of course, Jo and Heather from GSD Rescue also fell in love with our brave baby boy and continued to check on his progress though out his stay in hospital. 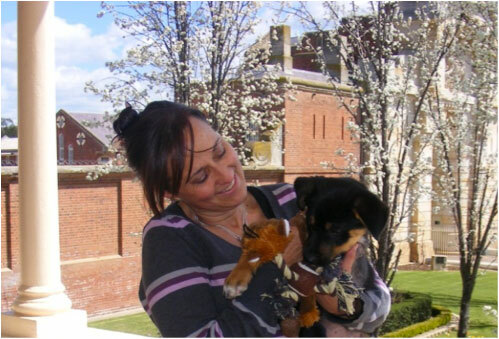 When it was time for Ranger to be discharged the lovely Jo and Heather came to his rescue. Though obviously not a German Shepherd, these ladies took him under their wing showing their love and kindness for all animals in need, whatever the type or breed. They now refer to themselves as “Ranger’s Sydney aunties” and remain in regular contact with us about Ranger’s progress. Jo collected Ranger from hospital and took him home for some more TLC. Heather then made the long trip from Sydney to Bathurst and back to return him to us at the Correctional Centre safe and sound, and in much better health and spirits than when he left us. Thanks to Jo and Heather for their support of Ranger. We have developed new friendships, and partnerships with German Shepherd Rescue and the Dogs for Diggers Program. We are amazed every day by Ranger’s resilience as he grows stronger and stronger. 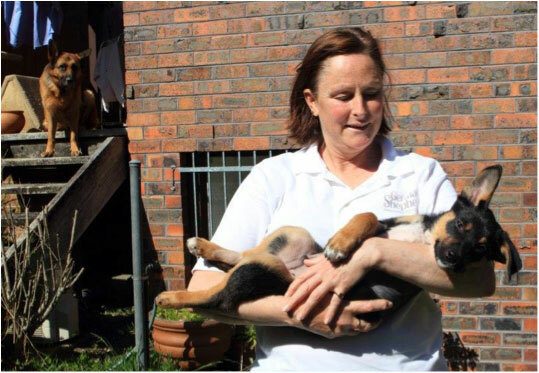 He manages so well on three legs and is in such good spirits, he is learning to be a puppy again – he is happy, safe, loved and cuddled. He loves, and is loved, by everyone he comes across – he has a special quality about him that melts everyone’s heart in an instant. An entire community has united in an effort to save Ranger. Thank you to the Bathurst Pound who donated him; the University Veterinary Teaching Hospital Sydney for their intensive medical care; German Shepherd Rescue for dropping everything to travel back and forth from Sydney to Bathurst (no matter how inconvenient) and sharing their homes with him; and also to various members of the Bathurst community who have assisted with his foster care. Ranger is to become an Ambassador for the Dogs for Diggers Program, he represents all rescue dogs and the hope that they can have a bright future. He will have his own Facebook page called ‘Saving Ranger’ and we will post his progress on a regular basis. We hope everyone can follow and support his amazing story as he becomes ‘a dog for all people’. He began his life as a dog no one wanted – abandoned in the bush to fend for himself, nine weeks old, suffering with a painful injury. He will become a dog to be shared and loved by everyone, proving that every creature is worthy of our care, compassion and kindness. Our oncology team, together with the research team at University of Sydney is working on a research project examining Border Collies’ longevity and current health status, with a particular focus on lymphoma. We are looking for people who own/breed Border Collies in Australia, or have done so in the past to complete a survey. All information provided in this survey is strictly confidential and should take about 5-10 minutes to complete. 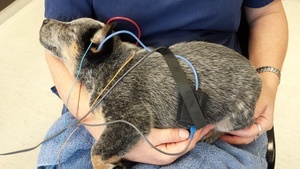 Veterinary science has benefited significantly from technological advances over recent years, with many procedures being adapted from human medicine. The advances have contributed to faster and more accurate diagnoses, and better treatments. At the University Veterinary Teaching Hospital Sydney, we continually look for ways to ensure we remain at the forefront of medical practice, and this includes working with researchers at the University’s Veterinary School and collaborating with with colleagues at other universities and research institutions. We have a broad range of research interests and we keep up to date with the current advanced researches in a variety of veterinary disciplines. We will post educational and informative articles here about research into the betterment of animal health and improvements to veterinary medicine. We hope that as we do, you will find them inspiring and informative. 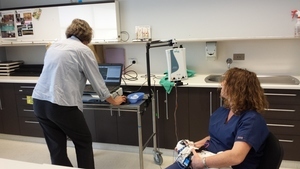 The University of Sydney’s Veterinary Teaching Hospital has established a canine blood bank to increase the reserves of blood available for life saving transfusions. With 40% of Australian households owning a dog there is significant demand for canine blood products for illnesses such as trauma and internal bleeding caused by poisoning. The hospital’s introduction of a blood bank complements a comprehensive range of general and specialist services that the University has introduced. “We are pleased to have achieved this important milestone” said Dr Griebsch. “In addition to a general practice, the clinic is a referral centre for other veterinarians to send complex cases, and a teaching hospital for veterinary science students to learn the practical components of veterinary care. The development of a blood bank was a logical step for a world class facility such as ours”. For information on how to participate in the University’s Canine Blood Donation Program, contact the University of Sydney Veterinary Teaching Hospital on 9351 3437.